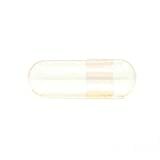 Pharmaceutical grade empty gelatin capsules. 100% HIDE gelatin derived from the skin. These capsules are perfect to fill any type of powders or any supplement like vitamins, herbs or other medications. 100% HIDE GELATIN CAPSULES(100% BSE FREE). FUNCAPS: Our FunCaps are assorted capsules including five flavors Lime, Orange,Strawberry, Grape, and Berry with animals printed on the capsules designed to administer medication and vitamins to kids..
FLAVORED CAPSULES: Flavored capsules are a innovative way to mask unpleasant tastes and odors while encapsulating medications and supplements..
RESEALABLE PACKAGING: All capsules are packaged and sealed in resealable plastic bags. Please note packaging may vary based on quantity.. Targeted towards pediatric products, FunCaps combines five fruit flavored gelatin capsules into one product. It's a party of colors and fruit flavors, including dark purple berry flavored gel caps, bright purple grape gel caps, light green lime gel caps, orange-colored orange gel caps and red strawberry gel caps. These gelatin capsules provide an excellent way to differentiate your product, improve patient/consumer compliance with a pill that kids enjoy taking. Kosher and Halal -- only ingredients are beef gelatin and purified water. No Preservatives, additives, gluten or GMO. Packaged and distributed by the manufacturer of The Capsule Machine, Capsule Connection. HIGHEST QUALITY - Our empty gelatin capsules are all made with BSE-Free 100% bovine pharmaceutical gelatin. They are both Kosher and Halal Certified. All of our capsules are manufactured in Colombia and come to you with the lowest amount of defects around..
STOP OVERSPENDING ON SUPPLEMENTS! Making your own capsules is much cheaper than going to the store and buying pre-made herbal supplements. Buying 1000 capsules at a time is enough to last an entire year..
DO YOU KNOW WHAT'S IN YOUR CAPSULES? When you fill your own capsules, you know exactly what is in them. 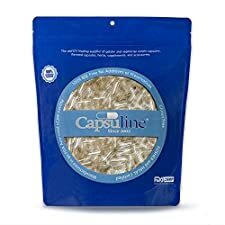 Your capsules will be packed with whatever you like and no added fillers or binders..
"Size 0" capsules hold approximately 400-800 mg. depending on the density of the substance that you are putting in them..
OUR 100% MONEY-BACK GUARANTEE! As with all of our products, we stand behind them 100%. We offer a no questions asked 30-day Money-Back Guarantee. If you are not happy for any reason, just let us know and we will refund your money..
✔ Guaranteed to Save YOU Time and Money! This is an economical and convenient way to take strong tasting herbs and avoid table binders and fillers which are commonly added to store-bought herbal supplements. 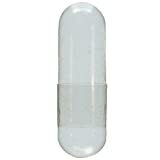 These Empty Gelatin Capsules are the HIGHEST QUALITY available. 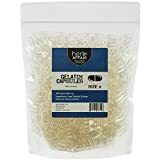 They close easily, snap tight and have the lowest incidence of dents of all the other gel caps available on the market today. ✔ Gelatin Capsules Ingredients Our gelatin capsules are completely tasteless, odorless and colorless, making them very easy to swallow as long as you pick the correct capsule size. 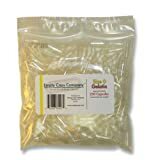 These capsules are an animal byproduct made from 100% bovine hide gelatin, also known as cow skin. They are also all 100% BSE-free, meaning they are free from mad cow disease. Capsules Come Connected - They Are Very Easy To Pull Apart, Fill, and Snap Together ✔ Easily fill these capsules with: • Powdered herbs • Food supplements • Vitamins • Medecine • Oils-- (Must Be Taken Immediately to Keep Capsules From Dissolving) • Or your own custom formulas ✔ How to Store Your Gelatin Capsules Capsules should always be stored in a cool and dry place to keep them from cracking or getting deformed. 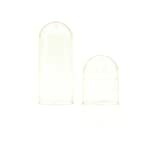 Gelatin capsules optimal temperature is 59°-77°Fahrenheit / 15°-25°Celsius with a relative humidity between 35-65%. If stored properly, these capsules can last for up to 5 years. ✔ DON'T WAIT! Join the THOUSANDS of happy customers. When you go to the top of the page and Click the Add-To-Cart Button you can start enjoying the benefits of these capsules right away! 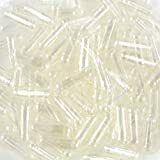 Pure clear capsules 10 bags of 1000 each. Lowest price available. Save by buying bulk. Sold direct from the manufacturer of The Capsule Machine, Capsule Connection. 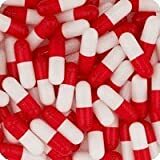 -BSE Free Certification Gelatin Capsules Halal Certificate Kosher Certification Product Description Natural capsules designed to fill any kind of medication like herbs, vitamins, and other substances. 100% HIDE GELATIN CAPSULES(100% BSE FREE). Features Pharmaceutical grade empty gelatin capsules derived from bovine raw materials sourced from BSE-free countries 100% HIDE gelatin derived from the skin Kosher certified and inspected. Halal certified and inspected Safety Information Do not fill capsules with any liquid suspension because it will dissolve prior to consumption. Keep out of direct sunlight, hot water and high temperatures. Doses depend on the powder and medication that the capsule is filled with and as needed. 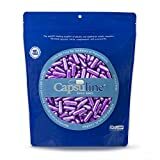 PETCAPS: Our PetCaps are flavored gelatin capsules designed to assit with administering medication to your pet. Mask the bad odors and tastes of your pet's medication..
HIGH QUALITY: Our gelatin flavored capsules are manufatured and packaged in state-of-the-art cGMP certified facilities meeting all health compliance requirements. 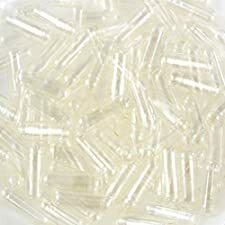 Our capsules are made using only 100% pharmaceutical grade gelatin..
Capsuline bacon flavored DOGcaps empty gel capsules are a dog's dream come true: capsules that smell and taste like bacon! Giving pills to dogs has never been easier, because dogs like these capsules smell and taste. 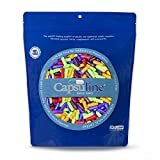 Ideal for manufacturers of supplements and pharmaceuticals for dogs, and also great for those who want a way to get their dogs to happily ingest smaller non-flavored pills. 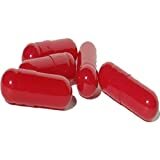 Dog owners can simply manually open the empty gel capsule, slip in the pill, and then close the capsule back up again. Made from BSE-free 100% bovine pharmaceutical-grade gelatin, available in size 0 and suitable for use with all dry ingredients. 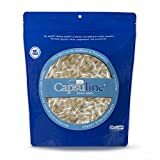 Capsuline Herbal Supplements FunCaps Gelatin Empty Capsules Size 0 1000 Count "
Our entire line of flavored capsules is made with the same high-quality gelatin as our regular capsules. With a wide range of delicious flavors, these capsules provide excellent marketability, superior odor-masking for pickier palates and the same usability of all our capsules. Features: Pharmaceutical-grade gelatin FD and C natural dyes 100% hide gelatin derived from animal skin Kosher certified and inspected. What better way to get your medicine than in a gelatin capsule that tastes and smells like a handful of fresh berries? Our entire line of flavored gelatin capsules is made with the same high-quality gelatin as our regular capsules. You get a product that stands out in the marketplace, superior odor-masking for pickier palates and excellent usability. Many sizes available in our online store. No yellowing, brittle, outdated capsules. Expiration date and lot number provided. 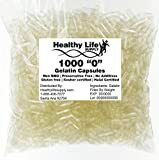 Empty Caps Company's best quality 2-piece gelatin capsules are superior because we maintain strict quality standards, and because we sell so many you know they're always fresh. We don't have cases of capsules sitting around aging and cracking in the heat. Each bag is factory sealed and shows both lot number and expiration date. "00" holds about 650 mg. or 1/5 tsp..